Are Women Pressured to Get Fit too Soon After Giving Birth?. Are new mothers under more pressure than ever to get their pre-baby shape as soon as possible? Recent events involving Maria Kang a.k.a 'What's Your Excuse?' mom or 'Fit Mom' and new mom Caroline Berg Eriksen, 26, the wife of Norwegian soccer player Lars-Kristian Eriksen, who posted a selfie of her slender toned physique just four days after giving birth suggest the answer is 'yes'. Though the pressure to snap back into shape soon after birth has always been significant for high profile celebrities, it seems like regular women are now subjected to the same types of pressures. This begs the question: how thin is the line between 'fitspiration' and 'thinspiration'? 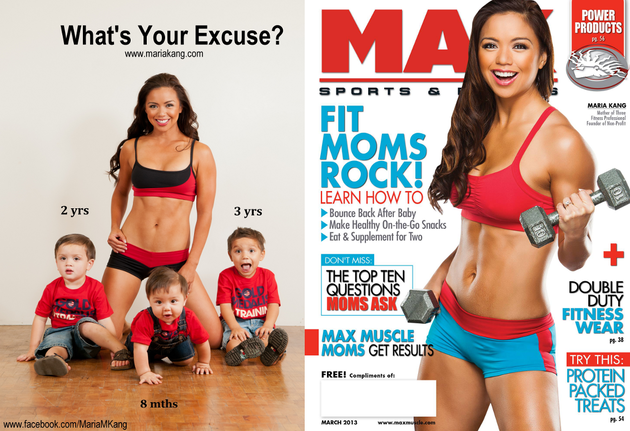 Fitness enthusiast and former trainer, Maria Kang, routinely gets into hot water for her assertions that everyone can get the results she got soon after birth, assertions which get labeled as 'fat shaming' and not 'motivational' as she repeatedly states they really are. After being banned shortly from Facebook last week, she managed to stir controversy once again. She was interviewed by CNN along with Chrystal Bougon, a plus-size lingerie store owner who launched a 'selfie' campaign promoting 'real beauty'. Of course, Chrystal Bougon, who owns The Curvy Girl Lingerie store in San Jose, was enraged by such assertions and immediately responded: “You can't tell whether or not I work out. You can't tell how healthy I am by looking at a photo of me. You just can't,” she stated. However, the story of Caroline Berg Eriksen, a 26-year-old fitness blogger who made it a point to show how chiseled her body is less than four days after the she gave birth by posting a photo of herself in a bathing suit on her Instagram account, has caused even more backlash. The wife of football player Lars-Kristian Eriksen gained 22 pounds during pregnancy, but snapped back into shape very quickly: “During the pregnancy, people kept telling me that my body will never be the same and I wanted to show everybody that’s not entirely true. Right after birth, like three minutes after, I felt like myself again,” she told ABC News. Her statements were regarded with disbelief by some while others felt it was a slap in the face of women who, for various reasons, don't manage to get similar results as fast. Like Maria Kang, Berg Eriksen, who stated she hasn't worked out since giving birth, says her intention was not to put down women who don't share her good luck: “I think all women should be proud of themselves, regardless of how they look after labor,” she added. Part of the outrage with these stories is the fact that neither of the two seem to acknowledge and take into account the fact that it is their job to look fit and that they have a flexible schedule, a luxury that many women don't have. But, aside from this aspect conveniently left out of the story, the subject is one that raises many important questions. Is social media a breeding ground for unhealthy comparisons? Are these 'motivational' posts beneficial or harmful to a woman's self esteem, particularly for new moms who have their hands full right after birth? Do they set unrealistic expectations for women as a whole? Is it really just a matter of encouraging moms to be healthy and take care of themselves or just a different example of how image-centric society really is? Do women feel pressured to get fit too soon after giving birth?